The mezquita looks like a fortress from the outside. Sometimes it takes me awhile to write about the grandest places we've visited because the thought of having to describe their beauty (and sort through our family's 100s of photos) is so overwhelming. That's my excuse for not having yet posted about the Mezquita (Spanish for "Mosque") in Córdoba which we visited last summer. 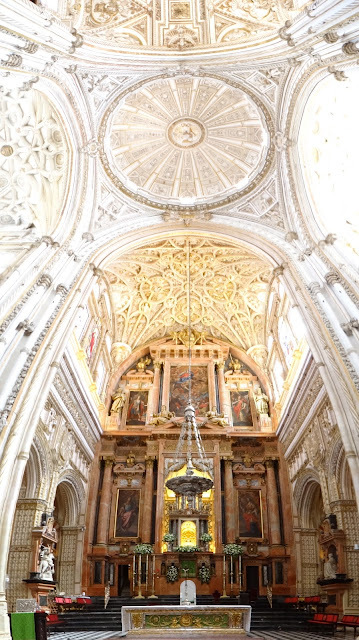 The Mezquita is an enormous building which began as a mosque in the 8th century but is now a Catholic cathedral. A mosque becoming a Catholic church in Spain is actually not unusual, but in Córdoba the mosque was not destroyed - a Renaissance cathedral was simply built right smack in the middle of the mosque, while the rest of the surrounding art and architecture remain the work of its Islamic builders. This is highly unusual. Upon entering the impressive Moorish structure the first thing you will undoubtedly marvel at is the repeating red and white candy cane arches EVERYWHERE. They appear on top of just about every one of the 856 columns of jasper, onyx, marble, and granite columns that hold up the expansive ceiling. After walking through the dimly lit forest of stripes, the Baroque cathedral interior at the center of the building does come as somewhat of a jolt. As opulent as any European cathedral, however, one is quickly captivated by the discordant splendor of it all. Interior of the cathedral in the middle of the mosque. If you are Catholic and attend one of the Sunday morning Masses, as we did, or are not Catholic and think you can endure a Catholic Mass, you can enter the Mezquita for free (as opposed to paying 8€ per person admission). Our family enjoyed attending service in such a unique structure and hearing the beautiful organ resound among the ancient Mezquita walls. The juxtaposition of Islamic and Baroque architecture. Outside the Mezquita is the Patio de los Naranjos, or Courtyard of the Orange Trees, which is filled with - of course - orange trees and their fragrant blossoms. There is also a lovely fountain here. The courtyard is free to enter. In the courtyard you can get some great photos of the massive bell tower, which, in the 1600s, was converted from a minaret to the tower. It is adorned with cathedral bells captured from Santiago de Compostela. What an incredible place! I have seen those candy cane arches in pictures and have always admired them. I can't imagine how beautiful they must have looked in person. How great that you were able to attend mass. I'm not sure I would have been able to pay much attention to the service surrounded by all those architectural wonders :) Loved all the pictures!